Amongst the hundreds of exhibitor companies at the Stuttgart Fastener Fair 2017, Lazpiur standed out with an offer of two lines of very different products (inspection machines and industrial tooling) which nonetheless share common factors: innovation, precision and quality. From the 28th to the 30th of March Lazpiur showcased a leading position in the production of fastener inspection machines, with cutting edge technology: dimensional vision inspection, surface defect analysis with photometry, mechanical checks of mountability / go-no go, induced currents applied to checks for cracks and/or verification of heat treatments... Lazpiur is the only company in the market offering a comprehensive range of this type of machines. 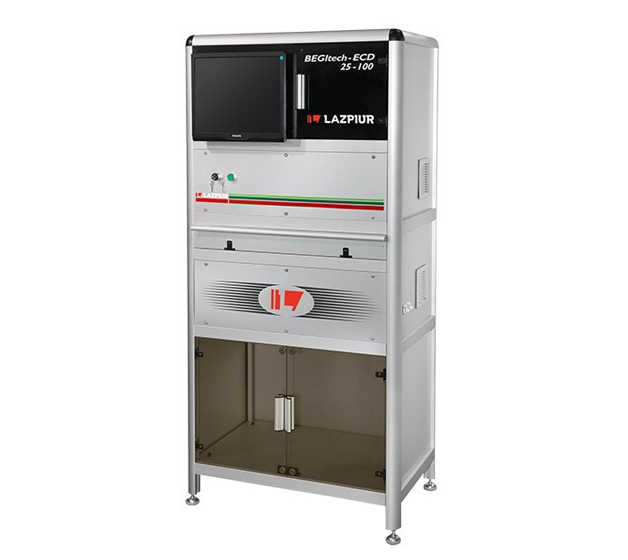 As evidence of the company's expertise, Lazpiur exhibited one of its most successful developments at Stuttgart; the BEGItech ECD PLUS machine. This system inspects parts individually, and is ideal for laboratories (control of first samples,...) or plants (statistical control of processes,..…).This will serve as a perfect replacement for profile projectors and manual measuring instruments (gauges, micrometers...). Another revolutionary fastener inspection machine on the market is the BEGItech CLT machine which has recently been recognised as one of the 'Top products of 2016' by the Fastener Technology International magazine in an article showcasing the top eight designs in the machinery industry. Lazpiur is also a leading player in the forging tooling sector. At the Fastener Fair 2017, this century-old company presented its latest innovations in this field where it has become an international benchmark. This was the only company at the fair with such a wide range of products, as Lazpiur specialises in manufacturing both wear and standard tooling. The Basque-based company has broadened its range of cold forging products in recent months with new types of dies based on advanced technologies. The benefits of this new technology include manufacturing cost savings, which can be of special interest in the automotive sector. The Stuttgart fair is the most distinguished fastener sector fair in the world. This year marked the fair's seventh edition, welcoming 800 exhibitors hailing from 40 different countries. A total of 11,060 visitor attended last year's Fastener Fair. The event brought together a wide spectrum of fastener-related technology, which is also used in such a wide range of sectors such as automotion, electronics, construction, machine construction and furniture, to name but a few.